On Wednesday, Forest City Ratner made it official: the world’s tallest prefabricated building will be coming to Brooklyn with a groundbreaking date set for December 18. 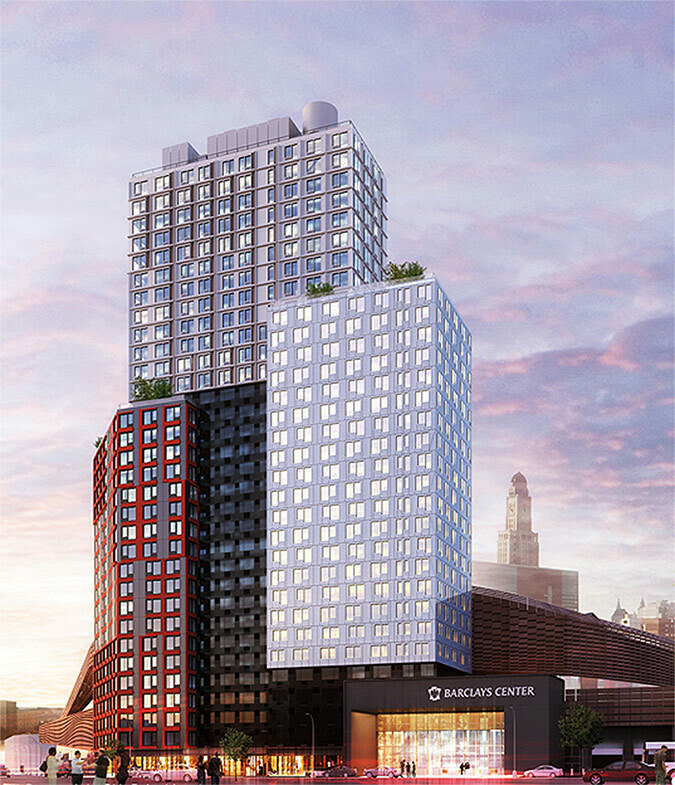 As AN outlined in our recent feature on Atlantic Yards, the SHoP Architects-designed B2 Tower will climb, modular unit by modular unit, 32 stories on a slender wedge-shaped parcel adjacent to the new Barclays Center on the corner of Flatbush Avenue and Dean Street. 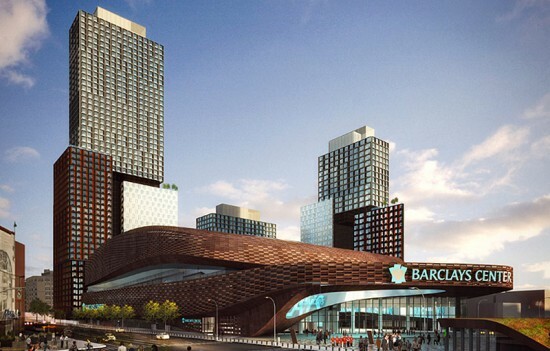 Renderings released with the groundbreaking announcement also revealed design revisions to the B2 Tower since it was unveiled in November 2011, and Chris Sharples, principal at SHoP, told AN what’s new. The red mass, nicknamed “the wedge” in SHoP’s offices, has been updated to de-emphasize the repetition of modular units. 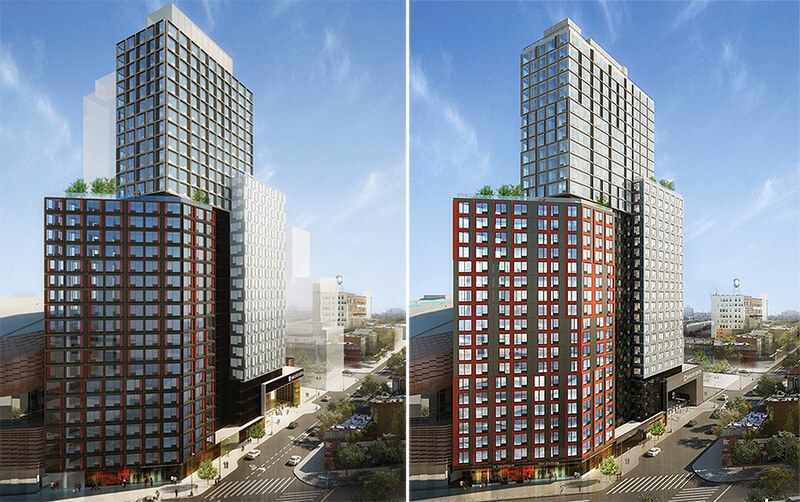 Previously, the facade was comprised of a rigid grid of charcoal-colored rectangles forming deep reveals with red accents.”There’s still relief, the red L-frames project out from the charcoal,” Sharples said. “It’s a bit more subtle.” The new arrangement creates a series of variegated vertical stripes, helping to create a singular unit rather than a stack of boxes. Each of the 930 prefabricated modules—called “mods”—will be manufactured at the nearby Brooklyn Navy Yard, part of a collaboration between Forest City and construction company Skanska, where controlled conditions will speed construction times. 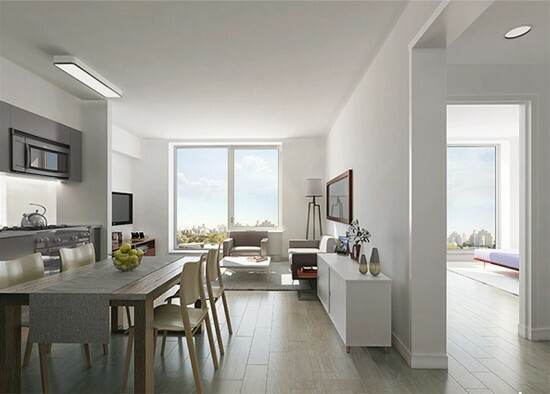 Each mod will arrive at the construction site fully assembled with all interior finishes and appliances installed. Up to three mods, measuring nearly 400 square feet, will make up each apartment. SHoP has designed the mods with hinged panels on the exterior that can fold down to cover joints during installation. 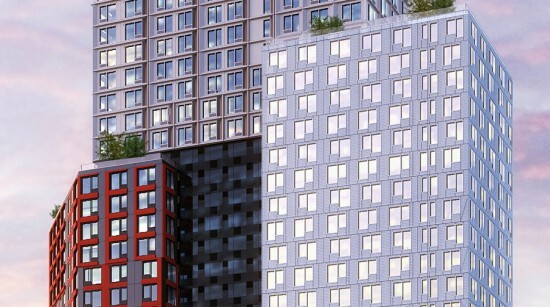 Sharples said these “mate lines” present a unique challenge with prefabricated design and will be some of the only finish work construction to take place on site. On the interior of the units, he noted, walls where two mods are joined will appear slightly thicker than traditional wall construction. 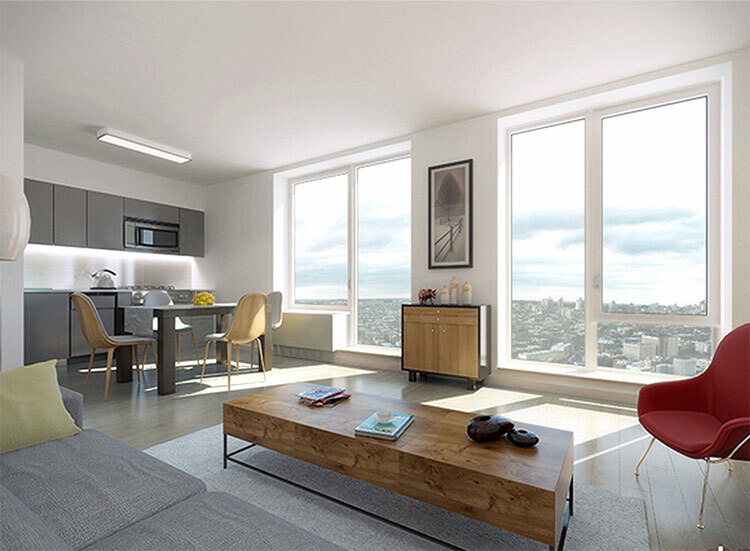 When complete, the B2 Tower will house 363 residential units over retail space and will feature roof terraces, indoor bike storage, common areas, and even a yoga studio. Developers are anticipating an opening in 2014.